Banners have been used for hundreds of years as rallying points for troops as with flags and as proud items of recognition carried before the troops or members in parades etc. 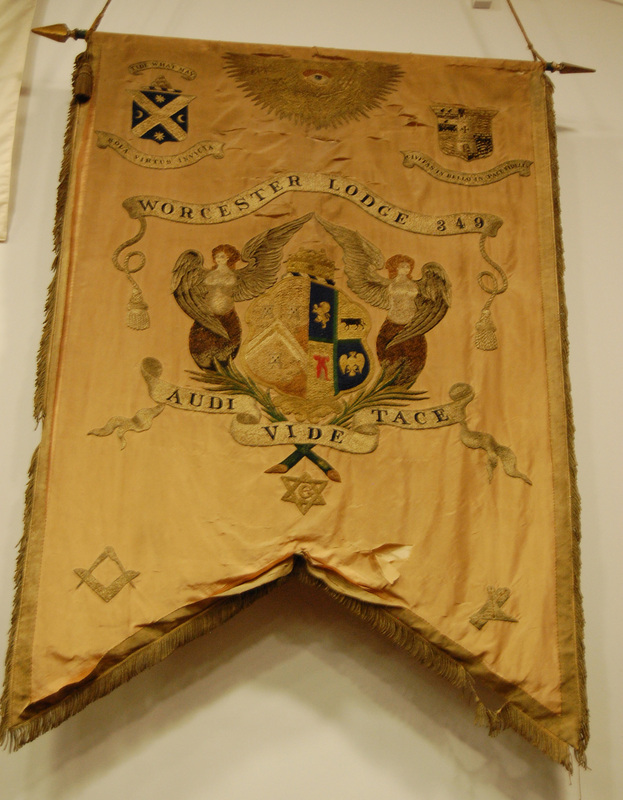 A first reference to the Worcester 280 banner is made in the minutes of an emergency meeting held on May 2nd 1825. On that day it was proposed that a banner be purchased, however there is no further reference to the banner (its arrival or dedication) in the minutes up to 1842. The banner was hung in pride of place above the entrance to the Lodge room at Rainbow Hill and apart from an occasional move for maintenance, did so until quite recently. Gravity, humidity and dust took their toll and in 2015 the Lodge decided that one more move would see the material of the banner disintegrate and make the banner unusable. Various ideas of renovation and replacement were put forward and after much consideration a replacement was felt to be the best way forward. This decision was made ideal by a very generous offer to cover the cost which came from a member (who wished to remain anonymous). A company based near Chepstow was recommended and contact was made. It would appear as with many other items nowadays a banner such as 280’s could be sourced overseas, keeping the cost low, without reducing the quality. The past masters committee decided to exactly copy the existing banner in both size and original colour and so it was commissioned. That of course was the start, for each device on the banner needed to be confirmed, photographed and original colour sourced, something that did not prove easy after many years of dust and low level pollution. However after many notes back and forth colours were chosen and a final proof agreed. The final banner proved a dazzling comparison against the original, which had clearly faded somewhat from its glorious beginning. The new banner was dedicated at the March 2017 meeting with visitors from all over Worcester and beyond along with the dedicating team from the Province. The festive board afterwards was great fun and it confirmed the health of a Lodge that is over 225 years old and which has met continuously since its dedication. It is hoped the banner will stand the test of time of the original and in many years hence perhaps a new digital hologram of this one will take its place!!! !